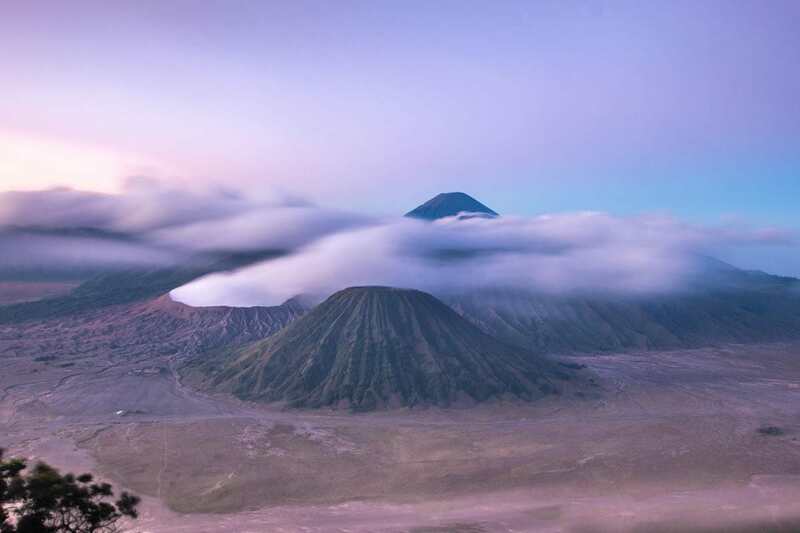 If you are planning your trip to Indonesia, you’ve probably stumbled upon one the countless Mount Bromo tours already and you are wondering if you can climb Mount Bromo for free on your own. 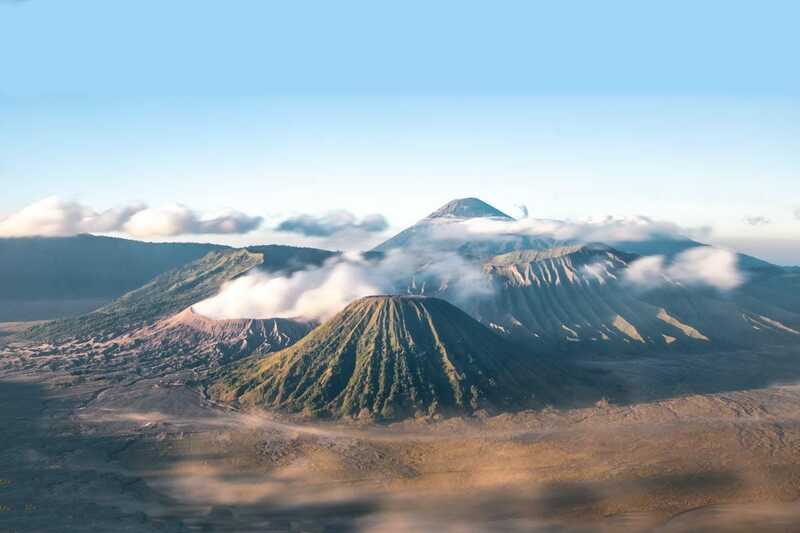 One of the biggest highlights of Indonesia, Mount Bromo is part of the Tengger-Semeru National Park situated in the east of the Java island and is a worldwide famous volcano you can hike without being a pro-climber. And let me tell you something – this place is absolutely stunning! 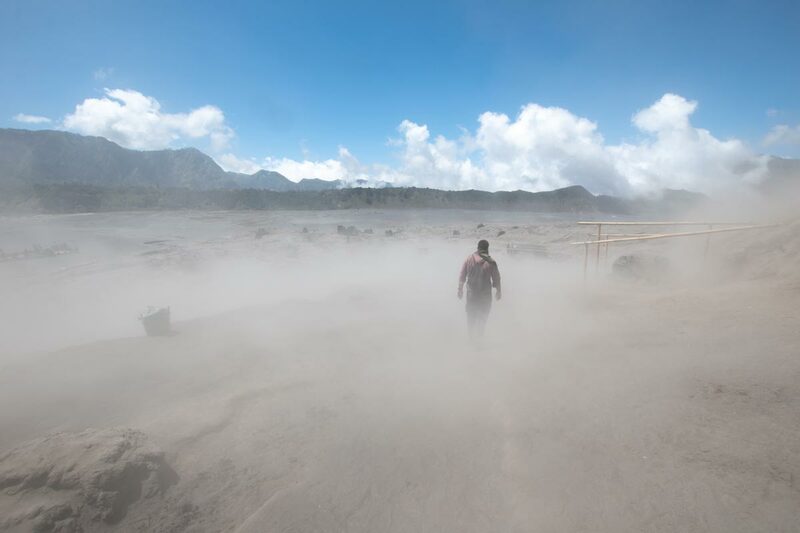 The Sea of Sand (and ashes) surrounding the volcano is as unique as it gets and staring inside the crater of Bromo is also an experience you would cherish till the end of your days. Let’s not forget the sunrise sight from one of the many many viewpoints around. 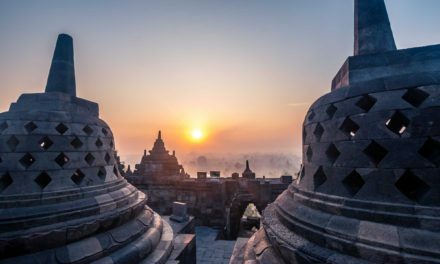 Catching the first sunlight there can easily become the highlight of your Indonesian trip, and everyone who’ve been in Indonesia knows how bold of a statement this is. 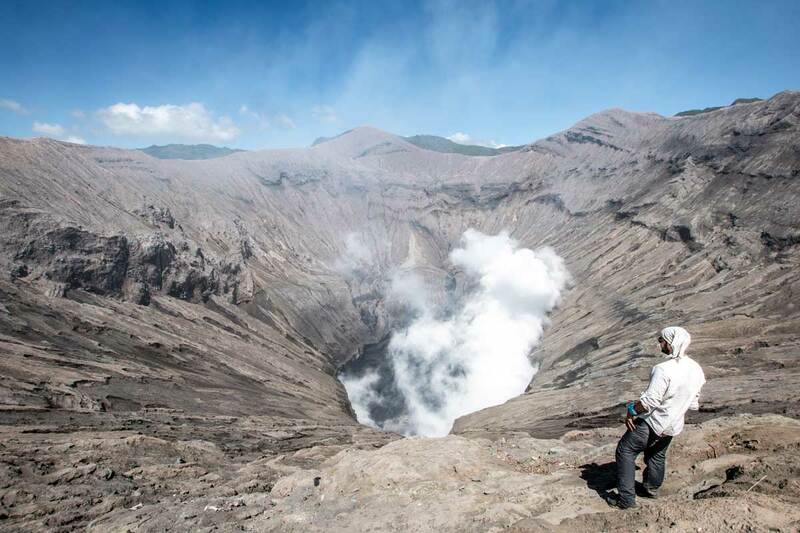 However, being such a fantastic place combined with being immensely popular, brings some negatives to Bromo, and if you don’t plan your visit carefully, they may ruin the whole experience. What am I talking about? The prices and the crowds. 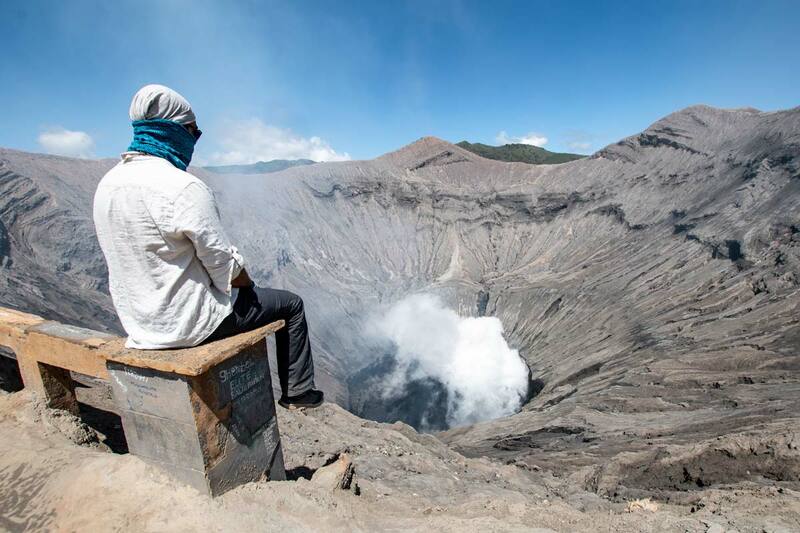 The easiest way to visit Mount Bromo is by booking a tour from Surabaya, Yogyakarta or Bali. Doing so, you will get you hundreds of dollars behind, and you would spend most of the time just sitting in a car getting bored to death. The worst of all – once you arrive at the volcano you would have to battle your way through crowds of thousands of other tourists. Not exaggerating here – literally hundreds of cars and thousands of people visit Bromo every single night (even more on the weekends). Can you see the line of cars surrounding the volcano? Oh, I almost forgot, you also have to pay two extra taxes – a small one to enter the village of Cemoro Lewang (10000IDR / 0.7USD) and not so small one to enter the volcano area – ( 350000IDR / 25USD ). 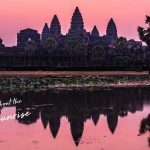 Are you starting to reconsider your trip already? Don’t! 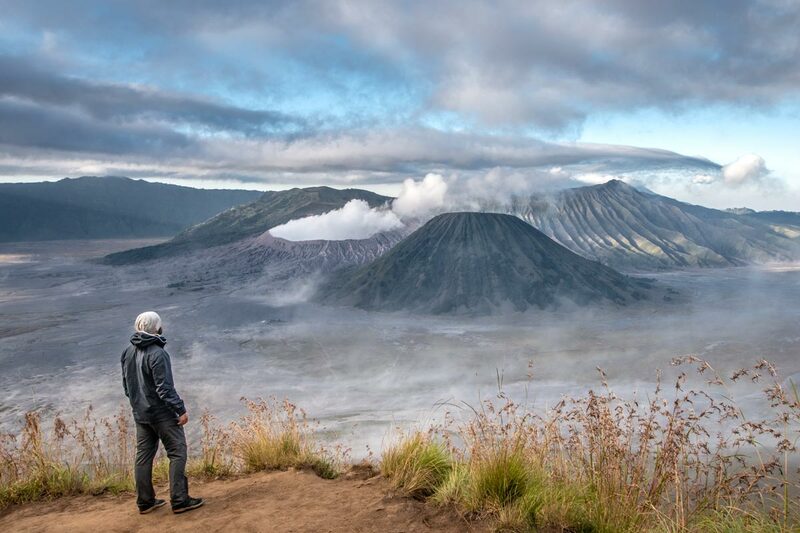 There is actually a way to climb Mount Bromo for free and skip the annoying crowds. *When I say for climb Mount Bromo for free, I don’t mean you won’t spend absolutely anything. 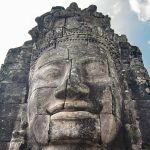 You still have to spend some rupiah for transport and, but as you’ll see in the end, the total amount of expenses won’t be anywhere near the price of the tours. How to get to Mount Bromo? 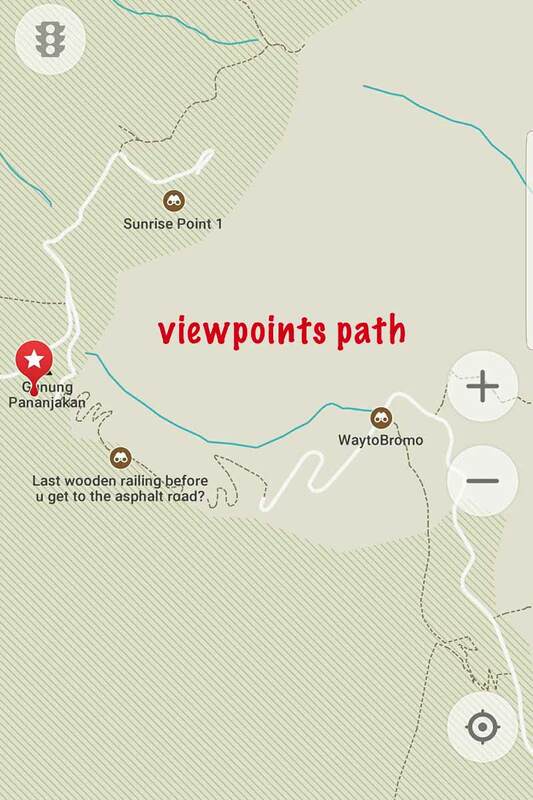 How to hike Mount Bromo for free – secret passage map! Is the whole fuss really worth it? 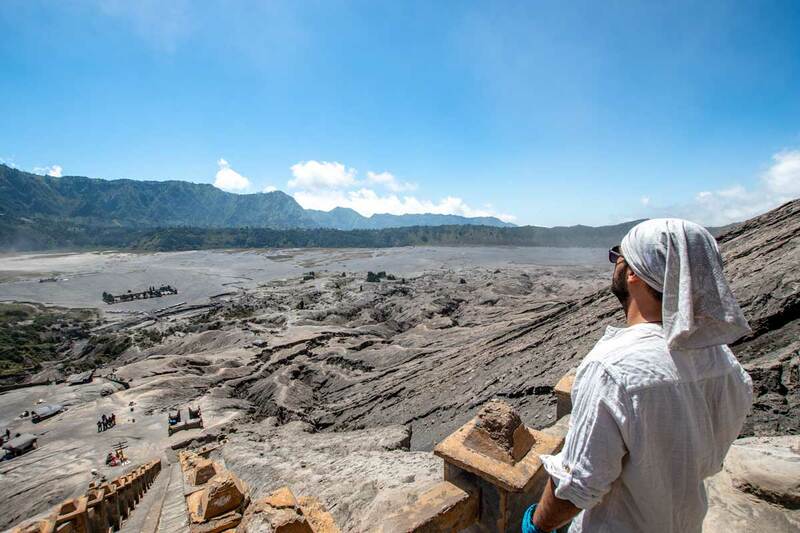 How to get to the viewpoints of Mount Bromo? Is climbing Mount Bromo safe? 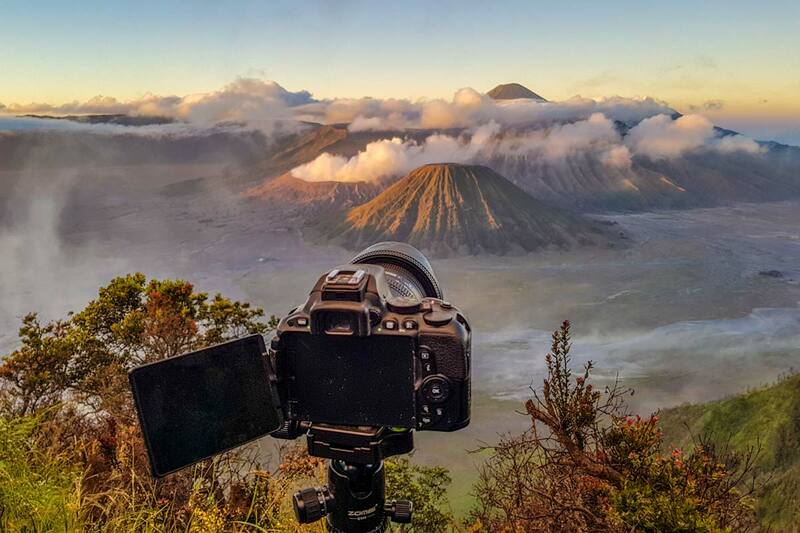 What do you need to climb Mount Bromo for free? Once on the bus station, find the one to Probolinggo (the destinations are over the buses) and get inside. IMPORTANT – the only place to buy a legit ticket is inside the bus, and it costs 30000IDR / 2USD. Do not buy anything from people who offer you at the station. The journey should be 2-3 hours. Have in mind that there is a chance to get an AC bus or one with just some fans in the back. Also, the bus may stop quite sometimes to get additional passengers on the way. 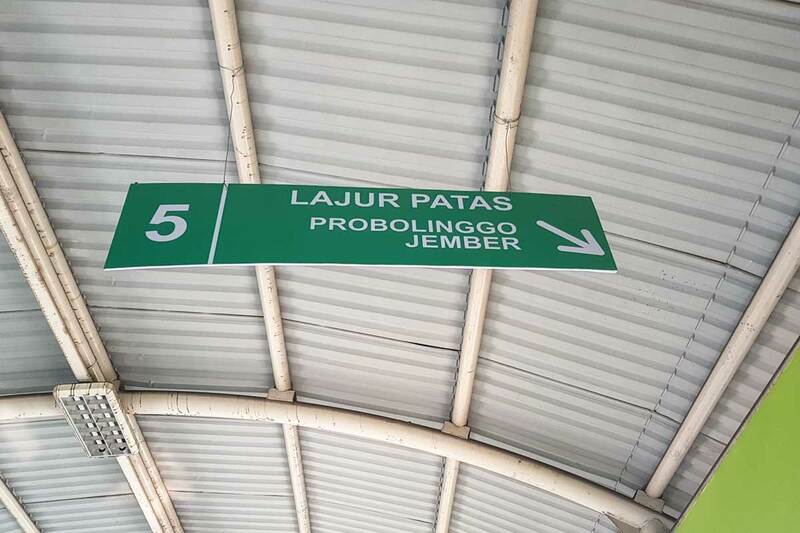 To catch the train to Probolinggo you need to make your way to Surabaya Gubeng Station. It’s 20km from the airport so I believe the taxi would be much more expensive than the one to the bus station; also there is no airport shuttle going there. The train option cost you more than the bus one but is more comfortable too. The most comfortable but also the most expensive way. The price here depends entirely on your haggling skills. 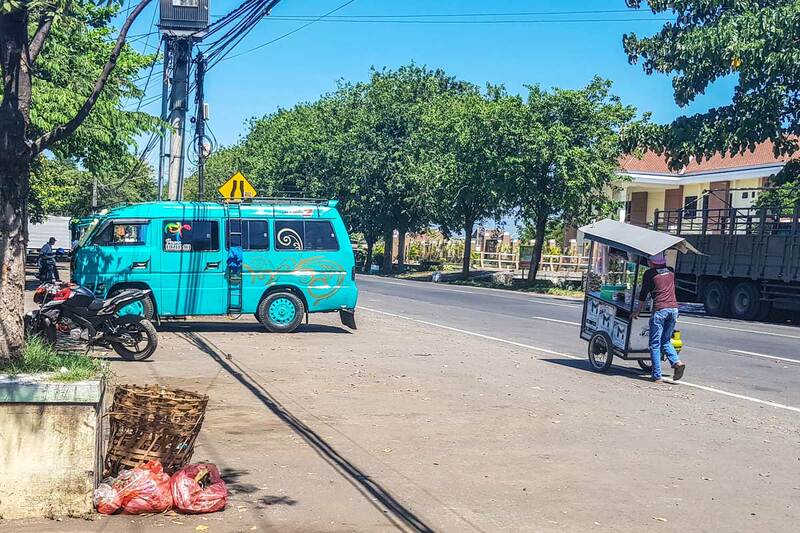 I got an offer of 500000IDR / 35USD from the Purabaya bus station to Mount Bromo, so maybe if you are a group of people and you like to haggle with taxi drivers, it’s worth it to explore the option. 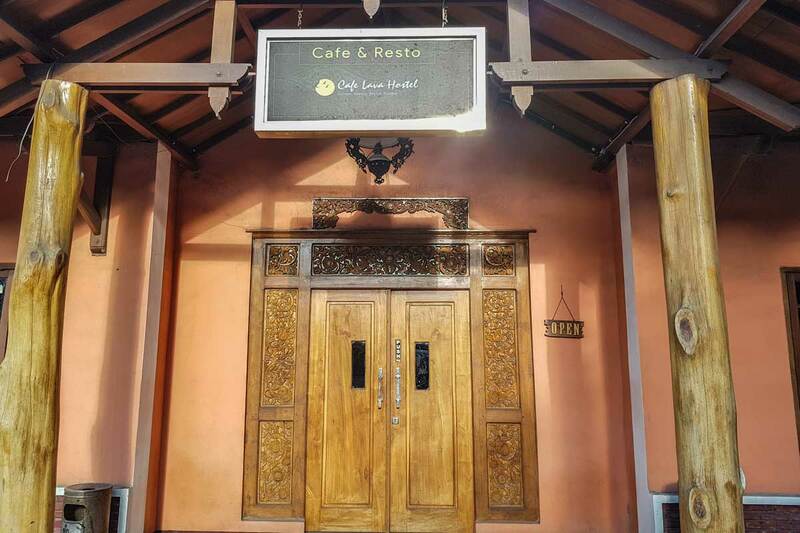 Once in Probolinggo, you need to make your way to the village right next to the crater of Mount Bromo – Cemoro Lawang. You have only one option here, and it’s the colorful public vans called Bemos. Once you are out of the bus/train station, you can find someone to take you to one. The bad thing about bemos is that they don’t really have a schedule, they go when they are full, and this may take hours. You can also offer to pay more and go faster. Full Bemo (15 people) should be 35000IDR / 2.5USD, bemo with ten people should be around 50000IDR / 3.5 USD per person. 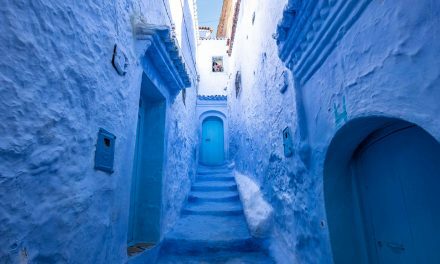 On the way back, It’s the same route you came – you get the bemo from the center of the village. If you are in a hurry, your hotel should be able to find you a taxi, but it won’t come cheap. Once in Cemoro Lawang, you can get easily to Mount Bromo without a tour. I suggest to explore the Sea of Sand and the crater during the day and go to the viewpoints on sunrise. 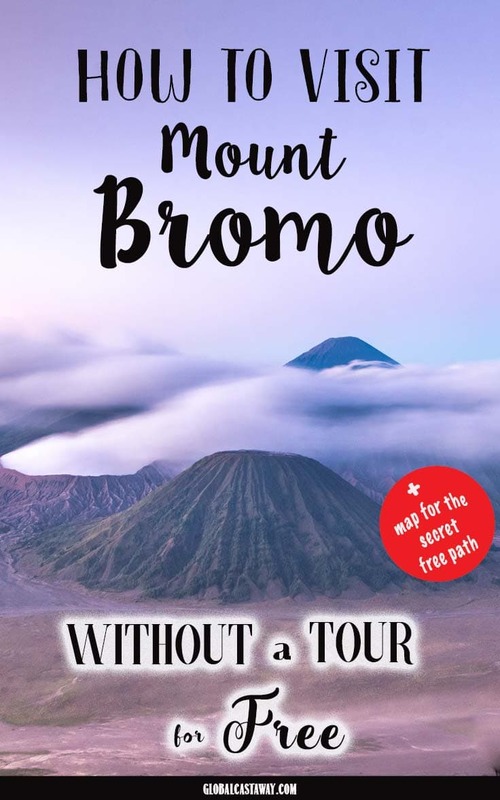 Since all tours go to the crater of Mount Bromo before (or right after) sunrise, during the day, there will be close to no people around it, and you can thoroughly enjoy this masterpiece of nature. To get there without paying the hefty 350k entrance fee, you need to find the secret passage next to hotel Cemara Indah. You get inside the parking lot and go right, down to the pathway that leads you to the Sea of Sand. Not only free but also a shortcut. 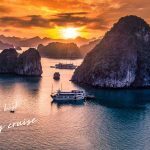 Read more: Where is the most famous sunrise in the world and how to see it best? Definitely! Don’t know about you but I rate my travels by the “wow moments” I have. Wow moment is something so amazing I can’t help but say WOW out loud (it’s kinda tricky when I’m diving). In Indonesia, I had five wow moments and two of them were around Mount Bromo. The first one – when I looked down to the crater of the volcano. It is such a humbling experience, getting that close to something that powerful you won’t have a choice but to say wow. The second one was the night when I was hiking to the viewpoints. The road was empty, there were gazillion stars in the sky and a scent of fresh jasmine in the air. One of my most perfect and relaxing moments ever. 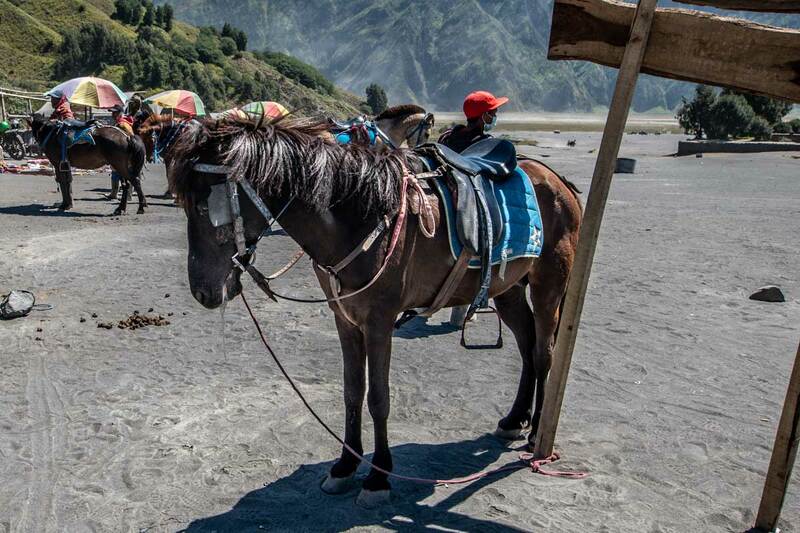 IMPORTANT: Once in the Bromo area you’re going to get a lot off offers for a horse ride up to the volcano. I plead you to deny them. Poor horses are severely mistreated, and it’s obvious their size is not suitable for riding up slopes with people on their backs. They have a hard time going up, slipping from time to time which gets them a whip as a reward… Please don’t support animal abuse. The path up is doable even for people with average fitness levels. Don’t make him carry you up there, please! That’s what I call a nice viewpoint! There are probably a dozen viewpoints located on the mount across Bromo – Penanjakan Hill. 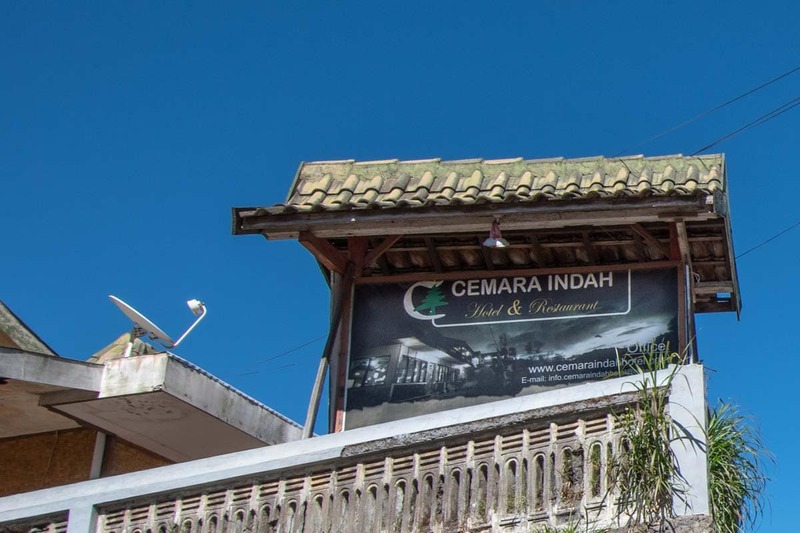 To get there, you don’t go in the Cemara Indah hotel, but you continue down the road. It will slowly become a climb, and you will see the parking lot which is also an excellent viewpoint. Continue going up, and you would find a lot of places to experience the magical Bromo sunrise. The top viewpoint is where all the tours go so I suggest to avoid it. There is one slightly bellow – King Kong viewpoint, where you can get the same sight with way fewer tourists. If you are not interested so much in the photo but more in the experience, I suggest you stop to any of the viewpoints along the path to King Kong. In most of the cases, you won’t have to share the sunrise there. Sunrise in Bromo is at 5:30 AM. I left my homestay at 2:30 AM, but I made quite a few stops along the way to take photos. 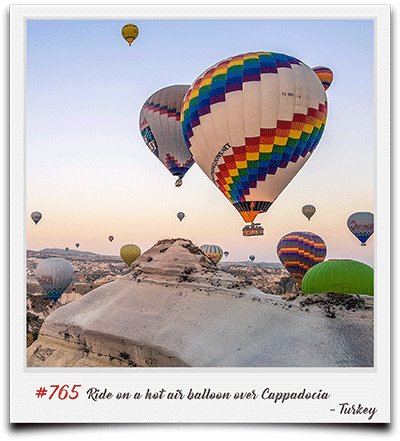 Most people leave at 3:30 AM and reach some of the top viewpoints without rushing. Wind and ashes – bad combination! 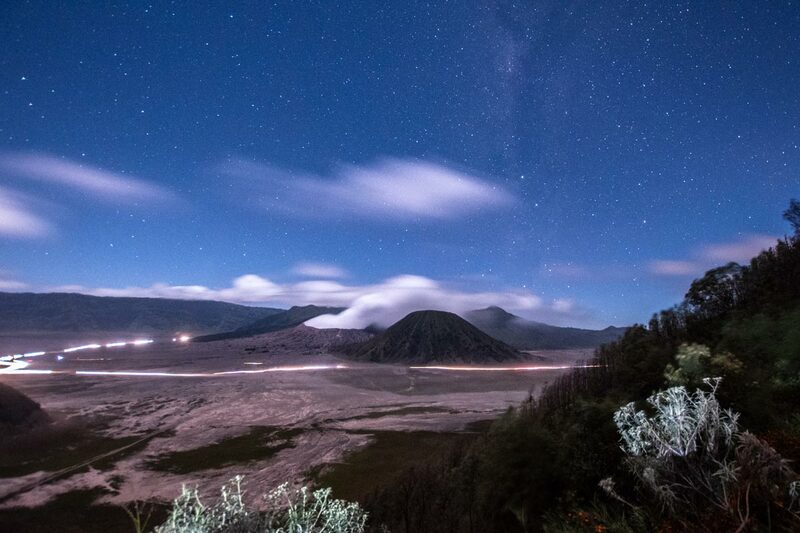 Unlike the rest of Indonesia, the temperatures around Mount Bromo gets quite low in the night. You definitely need to bring some long pants and layers. You can buy winter hats, scarfs and gloves by one of the many hawkers in Cemoro Lewang. It’s also windy all the time, which is not good when you are next to a place called The Sea of Sand. Have you wondered why the sunrise is so famous, but there is not a single mention about the sunset? The reason is that in the afternoon the winds often brought clouds that cover the crater and ruin the whole view. Damn you winds! 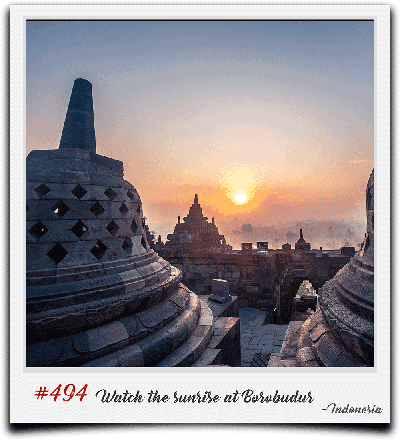 Fancy to experience more of Indonesia? Find out how to spot orangutans in Borneo! Since you are without a tour, you’ll need a place to stay for at least one night. The Cemoro Lewang area, however, is not very well managed for tourists. Most of the hotels are homestays with just basic conditions. There is hot water in most of them, but don’t be surprised if your breakfast is a cold egg and some rice or there is no window in your room. 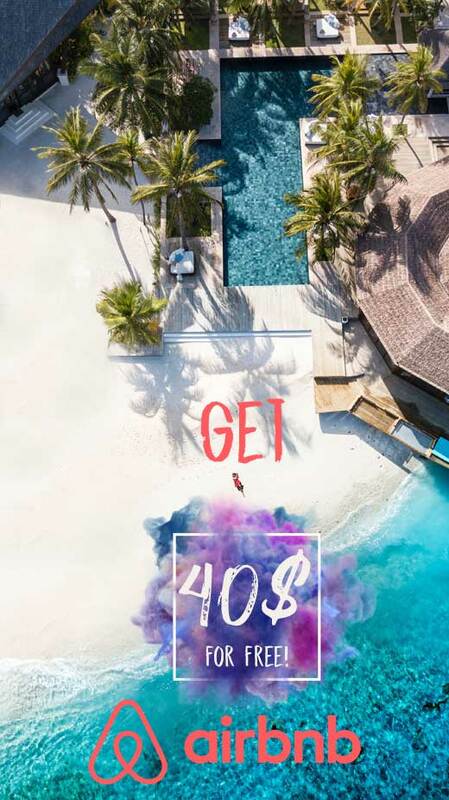 If you are ready to splurge a little bit more, you can check the Cemoro Indah Hotel (the same one with the secret passage) that offers a fantastic view, The Lava Hostel or the only resort in the area – The Lava View Lodge. Since you’re reading how to climb Mount Bromo for free, however, I suggest using the homestays. Finding a place to eat turned out to be a more significant challenge than expected. Not only there are very few restaurants, but they don’t seem to be open most of the time. In my first try, I walked and sit in one that had an open door and a local guy inside. He was playing a game on his phone and walked past me a few times without any signs he noticed me.15 minutes later, when I walked to him asking if it’s open, he was genuinely surprised to see me. Best place I found is the restaurant of the Lava Hostel. They had quite a few options, service was fast and the food was tasty. 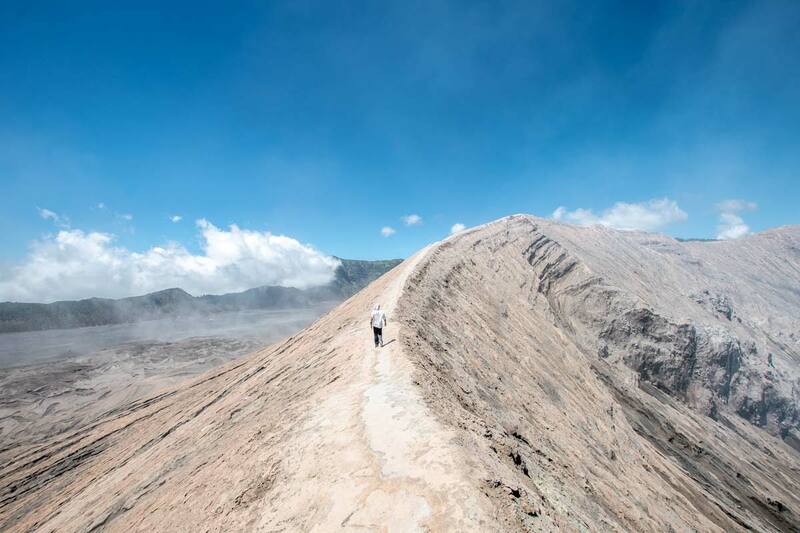 Climbing mount Bromo is as safe as climbing a volcano can be. However, you are just a moment of bad luck away to ruin not only your climb but your whole Indonesian adventure. Like I already mentioned, layer clothes and long pants. Hiking shoes are not needed but don’t go there with flip-flops either. Trainers will do just fine. If you stay in one of the homestays – make sure you have a towel with you. Sunglasses and sunscreen is a must. 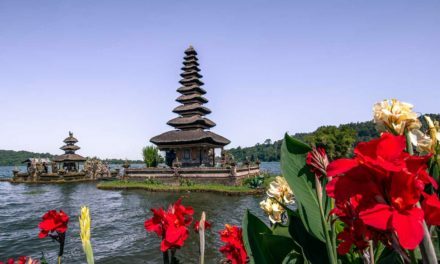 It may be windy but the Indonesian sun is still as strong as it is in Bali, and you are closer to it now. A scarf or a buff, even two buffs if you have. Wind + sand/ashes = bad combination. You also need a phone app called Maps.Me It’s an offline map generator so make sure you’ve downloaded the maps you need before you get to the area. Maps.Me has a huge database of small roads and paths you can’t find on google maps including the secret passage to the volcano and a detailed path to all viewpoints. That’s all from me, I hope you enjoy your Mount Bromo free hike! 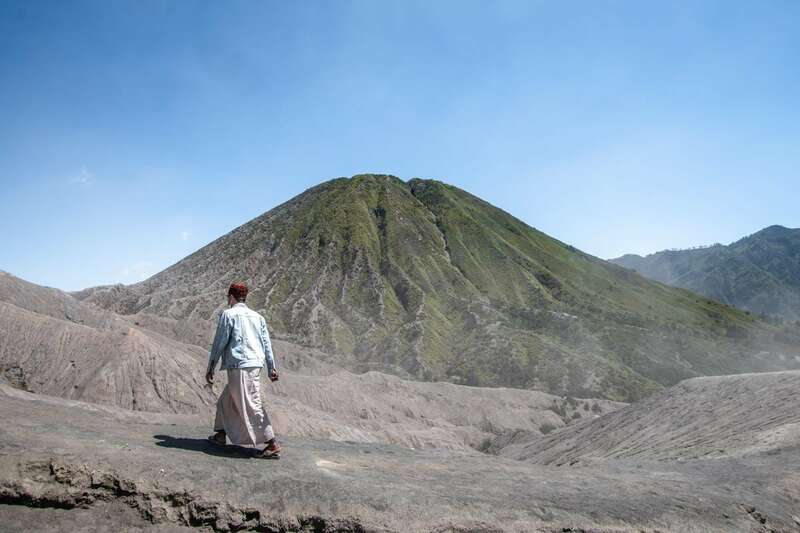 Have you tried climbing Mount Bromo for free? 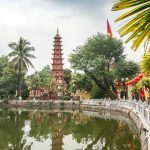 NextBorneo orangutan tour – What to expect and is it worth it? I used the village’s trail last week (August 2018) and can confirm the info in this post still applies! We went around noon and there was no one guarding the path. Thanks for the truly valuable info above. Question: Around what time can you expect to be done with the climb? Do you mean the climb to the crater of the volcano or to the viewpoints? The crater is an easy hike. Depending on how much time you spent in the sea of sand or on the top it may take you an hour or 4 hours. The viewpoints are a different beast. You may need 2-3 hours to get to one of the high ones, but there are many good spots on the way up where you can enjoy a kickass sunrise too. Thank you for taking the time to provide such an in depth account of your trip. 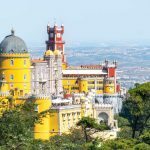 Just wondering though which accommodation is best for a solo traveler looking to meet other people? Hi there, Bob and sorry for the late reply. Unlike other places, the accommodation in Bromo is not the best place to meet people. Most travelers do it for a day meaning they arrive around noon, head to the volcano during the day and come back to their rooms just for a few hours of sleep before the early morning viewpoint trek. Anyways, the best place should be the Lava Hostel and their restaurant while the local homestays should be the worse (small rooms, rarely have a large common area). Hi Slavi. Thank you for all the Info. i have a few more questions which I would be grateful if you could answer. 1) I am reaching Probollingo by train at 2:!0 am and going to my hotel. Is it possible to start a hike at 7 or 8 am ? First to the view points and then to the sand dessert. 2) Even if i start at 4 am, is it safe to walk alone? Are there many people along the way? 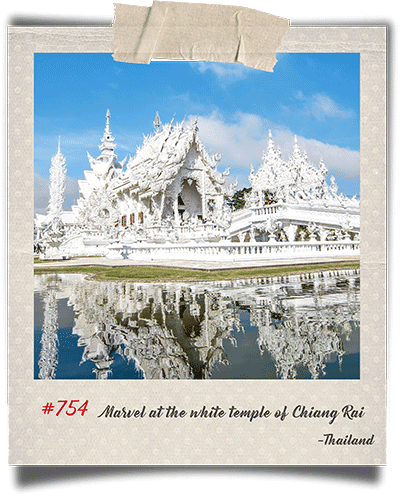 3) Is it easy to book a one day tour in the middle of the night? 4) Is it very hot during the day? 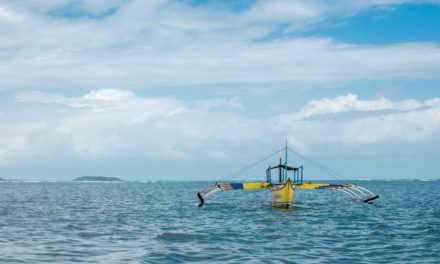 Ive read many websites and vlogs and they all talk about the sunrise tour. However, I wanna wake up at 7 and start my Mt. Bromo tour at 8 am. Nobody gives any information on this. Any idea why? and is this even possible? I hope I’m not too late with my answer. 1) It’s not a problem to do the viewpoints during the day, if you don’t really care about the sunrise, it’s even the better way to do it. You can do the viewpoints and the desert + crater in one day with moderate fitness levels imo (but it’s gonna be a long day). 2) There are a LOT of people in the night. 3AM is the Cemoro Lewang’s rush hour and there are tons of people. The whole place is as safe as it gets, people there depend on tourists for their living and they are aware of that. 3) This one should be possible to book either from your hotel or via some tour site like Getyourguide or Viator. 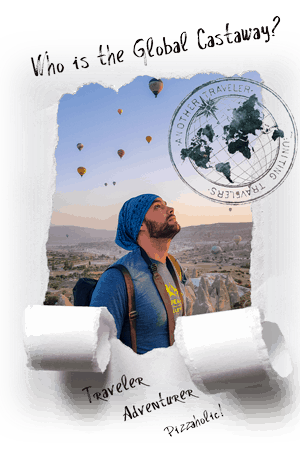 However, I don’t think you need an organized tour if you’re already staying so close to Bromo. 4) Nope, not hot at all. Maximum temperatures year round are around 17C (62F). The sun is strong though so make sure you get sunglasses, hat, and sunscreen. It’s also very windy so getting a scarf or a buff to protect you from the ashes + wind combination would serve you well. Honestly, I never saw anyone going on a day tour. People who used organized tours always had a sunrise one while the ones who explored by day did it on their own. 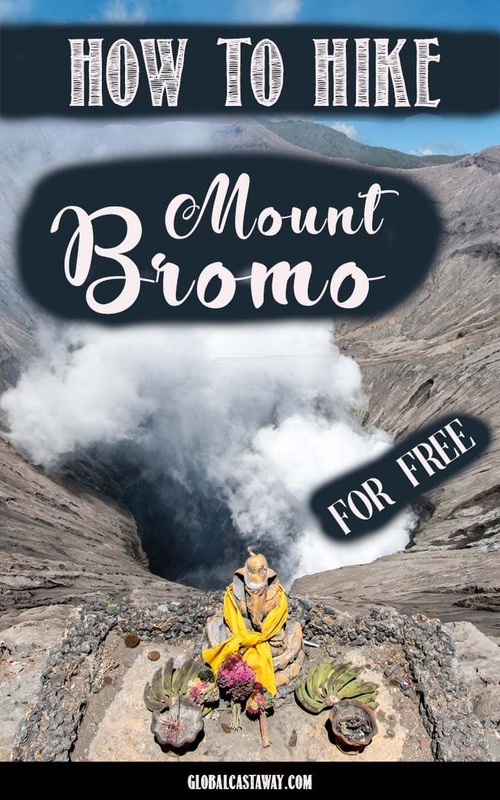 I hope this helps and you get an unforgettable Bromo experience! hi, may i know which viewpoint u went to get the top photo? it is so amazing. On the path to the King Kong viewpoint, you’d see a few natural terraces with a view to Bromo, this is where the photo was taken. They are not as high as King Kong but there is nobody there so you can even set up your tripod and take a selfie.